'Oumuamua might form the heart of an alien planet someday. Artist's illustration of 'Oumuamua, the first interstellar object ever confirmed in our own solar system. Widely wandering bodies such as the odd, needle-shaped 'Oumuamua — the first interstellar object ever confirmed in our own solar system — commonly seed nascent planetary systems, a new study suggests. Such visitors likely serve as scaffolds, allowing alien worlds to take shape much faster than they otherwise would, researchers said. "For decades, it has been investigated how planets grow from millimeter-sized grit to planets as huge as Jupiters. This growth process would be very slow, but observations tell us otherwise — some planets exist around very young stars," study lead author Susanne Pfalzner, of the Jülich Supercomputing Center and the Max Planck Institute for Radio Astronomy in Germany, said in a statement. "The presence of 100-meter-sized [330 feet] objects within this grit could accelerate the planet-formation process considerably," Pfalzner said. "Attracting the grit and gas of the surrounding disk, some of the former interstellar objects could grow into full planets." 'Oumuamua was first spotted zooming through the inner solar system in October 2017. The object's weird trajectory revealed that it came from very far away, and subsequent observations heightened the intrigue. 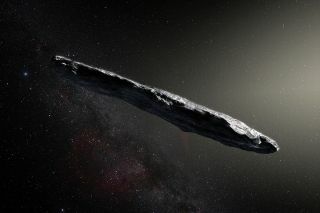 'Oumuamua is a reflective, narrow object perhaps six times longer than it is wide, and it appears to be tumbling in an odd way. The interstellar visitor's collective characteristics have spurred some speculation that it could be an alien spacecraft of some kind. Most scientists, however, believe it's an inert hunk of rock and ice. It's probably a comet that was ejected from its natal system long ago by a gravitational encounter with a migrating planet or a neighboring star, that idea goes. The fact that astronomers spotted 'Oumuamua at all suggests that such untethered objects are incredibly abundant throughout our Milky Way galaxy. And that would mean they stumble into newly forming solar systems quite often, the new study said. Rocky objects ejected into interstellar space may seed planet formation in other star systems, a new study suggests. "The consequences of this discovery might be far-reaching," Bannister said in the same statement. "Across the galaxy, the debris of past planetary systems would help build the next generation of planetary systems. Every new generation of stars would increase the abundance of interstellar objects through space."